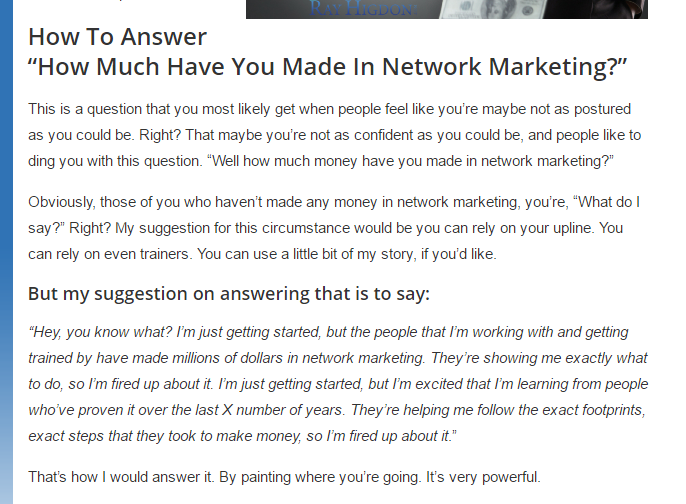 Recently Ray Higdon, a self-professed high flyer in MLM and inspiration coach, posted on his blog "How to Answer 'How much Money Have you Made in Network Marketing". His answer is evasive and shocking, as it basically sidestepped the answer. Obviously, those of you who haven’t made any money in network marketing, you’re, “What do I say?” Right? My suggestion for this circumstance would be you can rely on your upline. You can rely on even trainers. You can use a little bit of my story, if you’d like. That’s how I would answer it. By painting where you’re going. It’s very powerful. Yep, you read it right: self-professed MLM coach telling everybody to NOT ANSWER THE QUESTION. Be evasive, blah blah about "getting training" instead. Right, and my teacher was "Rich Dad", Bill Gates, and Buckminster Fuller. Or I can rattle all the rich and famous people I'd like to emulate. Let's face it: if there is a formula to make money, everybody who cares to be would be already rich. The truth is simple: EVERYBODY'S CIRCUMSTANCES ARE DIFFERENT. Those who push the idea that there are "footprints to follow" are basically camp followers and wannabes enjoying the "churn" in the MLM industry, never quite rising to the top. The few who did by chance then perpetuate the myth that they did it by hard work, ignoring those who they stepped on, on their way to the top. Furthermore, by being evasive, that is NOT the kind of person who answers ethically. Indeed, this sort of "I believe I'll get there" is smack of faith and cult-think. Let's face it... When you are asked how much do you make, would any industry OTHER than MLM try to shift the focus onto "I'm being trained by people who made money"? Heck, not even sales people do that. And this is supposedly a top MLM trainer saying how they would answer the question personally! Furthermore, the idea that MLM created a lot of millionaires is a myth perpetuated by MLMers, and they've been saying it for over 40 years. Direct sales, of which MLM is but a fraction, is 0.64% of total US retail as of 2012. MLM has been on a DECLINE since 2006 and only recently started to recover. But perhaps you should not have been surprised, when Ray's slug line is "Helping Network Marketers Recruit More Reps, "Get More Leads, & Become Top Earners in Their Company"
Nowhere was 'sell more stuff' mentioned. Basically, this guy treats MLM like a recruitment game: tell any sort of thing to recruit the next guy, gal, or alien. More you recruit, the more you win. Even "leads" are for recruiting, not sales. That's not that multi-level marketing is about. Well, what exactly do you expect Ray or any other person in MM to say when the current ethos is to make no income claims. How about is we just let people state the facts. Unless a co. is new, there is usually someone in that co. to whom everyone can point as an example of what is possible. And to underscore the comparison to a lottery -- lotteries are legal, and run by governments. The chance of winning and getting any of their money back is miniscule and an "investor" into the scheme has ZERO control. How about we make those illegal?